C3PO, the nebbish android from the 'Star Wars' movies, was recently arrested and charged with possession of a controlled substance, namely anabolic steroids. 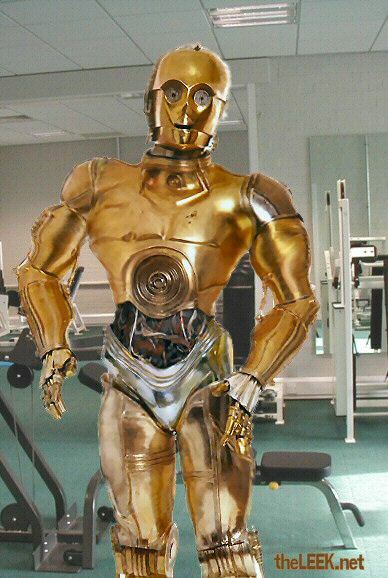 C3PO claims that he never intended to deal or share these steroids with other droids. "I just didn't want to be typecast as a wimp for the rest of my acting career" he said to the LEEK in an exclusive interview, "I desperately needed to change my image". He then added: "I have always wanted to participate in cool movies, such as 'HellBot', 'RoboChop' and 'Undercover Droid Brother', but the only parts I was offered were portraying spineless characters with an annoying accent, in movies like 'SpongeBot', 'Superficial Intelligence' and 'RoboFlop'". No different was his recent, futile attempt to audition as a Greek soldier for the Movie 'RoboTroy' (see image below). "They claimed they wanted a Zeus, not a wuss", says C3PO bitterly. "The final straw was an offer to star in 'Revenge of the Nerds XII - Android Edition' " exclaims C3PO - "This is when I decided to join a fitness club and get in shape". Albeit the plan has proven difficult: "After the damage caused to a gym by the robot from 'Terminator', no club would accept androids" he reveals. 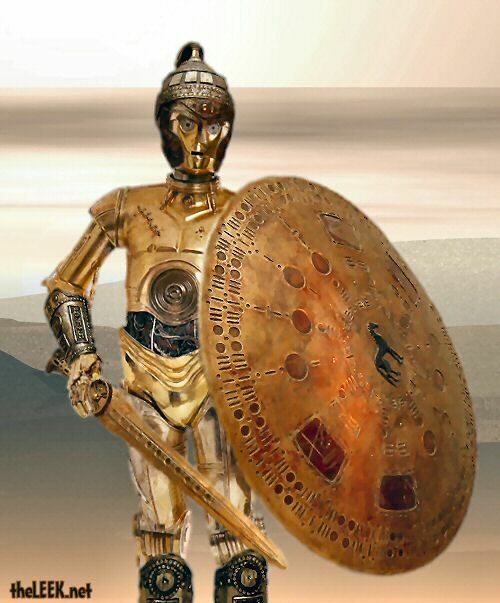 "That left me no choice but to use a special mix of steroids and Iron" admits C3PO. After three months, the results were impressive (see image below), and warranted him a key role in the upcoming 'Terminator IV' movie. But other androids suspected foul play. "That R2D2 and his big mouth" grumbles C3PO, "He had to tell everybody. He even started calling me 'The Steroid Android'. I have just had about enough of this chubby piece of metal!" Other robots vigorously deny any involvement in the steroid scandal. 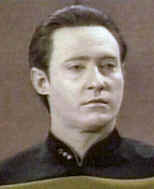 Data, the android from 'Star Trek Generations' released the following statement: "I am designed to exceed human capacity, both mentally and physically. I do not need to administer steroids to facilitate operation within my established parameters". Johnny Five, the robot from the 'Short Circuit' movies, had no comments other than raising his eyebrows.